Accept appointments online and allow customers to book with your business for free. Allow your customers to book appointments and reservations online, from anywhere! Manage all your bookings, clients, and team members, on any device, all in one place! Run your business seamlessly. Accept payments, connect to existing apps, and more! Set a Time helps your business manage new and existing appointments, and allows you to book more customers. Reduce no shows and save your business time and money by using the best class scheduling software. Your appointments are automatically organized and added into a calendar app on Set a Time. Personalize the look of your booking page to make it feel exactly like your business. Add and manage staff and allow your customers to book with them. Both businesses and customers receive emails and SMS text messages. Simply connect to your existing apps to make your business even more efficent. Fast, easy to use, and secure, for businesses and their customers. 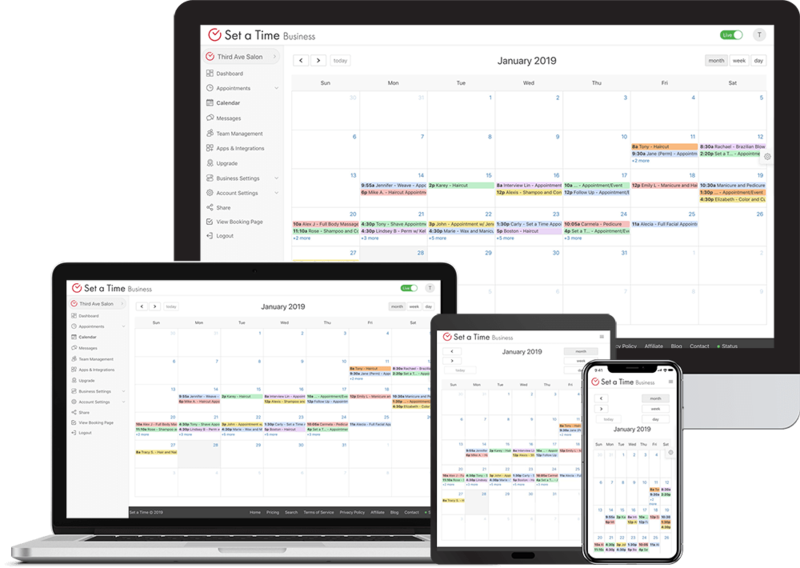 Whether you're a salon owner, tutor, doctor, dentist, gym, or yoga instructor, you're going to need an appointment scheduling software. Set specific dates and times for your business to accept appointments from your customers. Customize your business booking page by changing the look and feel, business information, and location. Set a Time makes it easier for your customers and clients to book and reserve appointments. With a scheduling software, your business can accept appointments online, even during closed hours! Customers can book appointments with your business from any where, on any device, at any time! Sign up your business and customize everything about your business/company on Set a Time. Choose your opening and closing times for when you want to accept appointments online. Share your online appointment booking page with others and start accepting appointments. Did you know we're the recommended scheduling app and software by businesses from all around the world? "Hours of searching for the best appointment scheduling solution, I've finally found the one." You're not alone! What are you waiting for?